St. Louis Lawn Care, Inc.
Best service. They take pride in making your lawn look great. We love St. Louis Lawn Care! So impressed with our recent services with St. Louis Lawn Care!! Why you should choose St. Louis Lawn Care, Inc.
St. Louis Lawn Care is owned by Dan Jenkerson and his two sons, Tim and Nick. Dan is a Police Officer and Firefighter in the City of Des Peres, MO. What this means is that you will be dealing and speaking directly with an owner of the business when you call us. If you call, we answer, or do our best to return your call as soon as possible. You will have a direct line to an owner at all times so any questions that may arise will be gladly answered by an owner of the business. We offer superior customer service, we want you to be pleased with your lawn service and maintenace and we want you have the best lawn possible. We stress safety with our employees and we have never had a claim on our insurance, but we carry both general liability and workman’s comp insurance for your piece of mind. This means if we happen to damage your property or someone injures themselves you are not liable for the damages, everything is covered by us and the insurance company. Many lawn services do not carry these insurances and they put their customers at risk, but we at St. Louis Lawn Care want our customers to feel comfortable while we service your property. We show up when we say we are going to show up. We will be at your lawn every week when you are a customer of ours. We have back up for all of our equipment in case any of our trucks or mowers break down we can replace them at our shop. This means that St. Louis Lawn Care will be at your lawn when we say we will be there. St. Louis Lawn Care specializes in residential and commercial lawn care and land maintenance. With over 16 years experience in the lawn care business in St. Louis we will make your lawn look great. Get your lawn professionally striped like the outfield in Busch Stadium, or like a fairway on a nice golf course. We will work with you to provide you with a lawn you will be proud of. St. Louis Lawn Care will enhance the look of your lawn. We will cut your grass, fertilize your lawn, aerate, and overseed. With this combination of services, you will have the best lawn in the neighborhood. St. Louis Lawn Care specializes in maintaining lawns all over the St. Louis area. If you are looking for a professional, reliable, experienced lawn service company to maintain your lawn, then give St. Louis Lawn Care a call. Call St. Louis Lawn Care to have your lawn mowed and looking great week after week. A key part of maintaining a beautiful lawn is mowing. Mowing is what is done most frequently. A lawn that is mowed correctly will be healthy and this will help defend off weeds. Mowing the lawn can be a chore, and that is why St. Louis Lawn Care is here to help. At St. Louis Lawn Care we will cut your grass at the optimum height for your type of grass and time of year. St. Louis Lawn Care performs regular maintenance on all equipment to ensure that we are cutting your grass with the sharpest blades possible. The sharp blades will give your grass a clean cut without damaging the leaf of the grass. St. Louis Lawn Care will leave the professional looking stripes in the grass after we mow your lawn. To some people mowing the lawn can be a hassle and a waste of time. At St. Louis Lawn Care we love to mow lawns and we would love to cut your grass. St. Louis Lawn Care takes pride in every lawn that we maintain. We want every lawn that we maintain to look the best. St. Louis Lawn Care is an experienced professional service company that can help make your lawn look better than it ever has before. St. Louis Lawn Care services all areas in the St. Louis, Missouri area. St. Louis Lawn Care’s service area is not limited to the areas listed above. If you live in and around the St. Louis area call for a free estimate for lawn service. St. Louis Lawn Care offers a wide variety of landscaping services. Our landscaping services can add a much desired outdoor space to your house. We offer any landscape service you can think of. 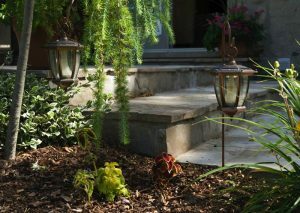 From small plantings, to big hardscapes and outdoor living spaces. We can handle any landscape you can dream up. Our landscape services include everything, including, ponds, patios, retaining walls, pavers, custom designed landscape plantings, water features, irrigation systems, and more. We can perform any landscape job you can think of. We have the experience and expertise to handle any size landscape job. St. Louis Lawn Care prides ourselves on building you the landscape of your dreams. An early spring application will involve fertilizer and crab grass control. This will prevent the crabgrass from growing before it starts. A broadleaf weedspray will take care of any broadleaf type weeds such as dandelion, clover, etc. St. Louis Lawn Care will customize a fertilization program to fit the type of grass that makes up your lawn and we will work with your budget. St. Louis Lawn Care offers various fertilization programs based on the needs of your lawn. 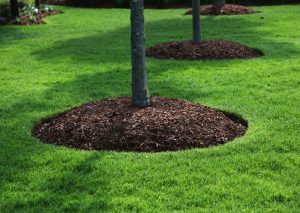 St. Louis Lawn Care offers the option of organic fertilizer. If you are looking for an alternative to the traditional fertilizers, organic fertilizers are the way to go. The ideal time for aeration and overseeding is in the fall, but the next best time is spring. If you did not get a chance to aerate and overseed your lawn in the fall, then early spring is a good time to do so. Let St. Louis Lawn Care mow your lawn this season. St. Louis Lawn Care will mow your lawn and keep the grass cut at the correct height all year long. Don’t spend all of your time mowing your lawn. St. Louis Lawn Care will mow your lawn at a great price. The lawn needs to be mowed all year long and having a strong lawn maintenance plan in place makes it easier to manager. Cutting the grass at the right height during the hot St. Louis summer can save a lawn. 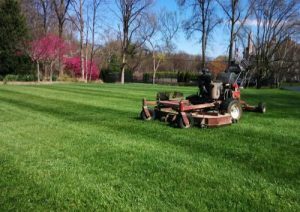 St. Louis Lawn Care will mow your lawn at the optimum height all summer long and follow a detailed lawn maintenance plan. St. Louis Lawn Care offers a lawn maintenance service that involves cleaning out and weeding all flower beds and landscaped areas. Weeds can grow out of control in the summertime, especially in flower beds and landscaped areas. Let St. Louis Lawn Care remove and dispose of overgrown debris and weeds. Call today to inquire about this service. Fungus and disease can wreak havoc on lawns during the summer. The summers in St. Louis will stress your lawn out and allow lawn fungus and disease to take over. 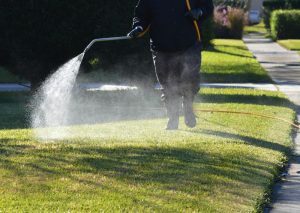 St. Louis Lawn Care offers fungicide applications to help prevent fungus and disease from taking over your lawn. The extreme conditions of the St. Louis summer has thinned out and damaged many yards. 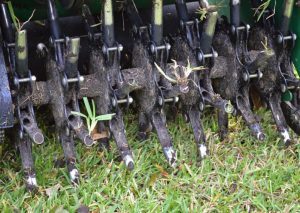 Aerating will provide a much needed stress relief for your lawn. 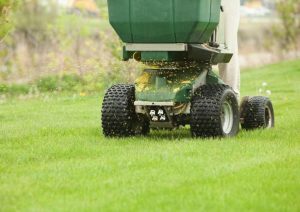 And the over seeding will thicken up your lawn and provide a head start for the following spring. Fall leaf removal time is here. Let St. Louis Lawn Care do your leaf clean up and get it ready for next spring. 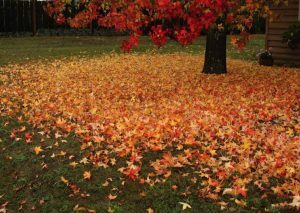 Remove all of the falling leaves and debris from your lawn and give it a better start in the spring season. A fall leaf clean up will remove the excess leaves that will suffocate your lawn. St. Louis Lawn Care offers snow removal. St. Louis snow removal involves snow plowing from asphalt, and snow shoveling and snow blowing from sidewalks and other areas. We also offer salt, and ice melt services to prevent ice from freezing on walking areas. Give us a call today to set up a snow and ice maintenance schedule for this winter. Don’t wait until it is too late to find a reliable, dependable snow removal service in St. Louis. We are very reliable, and show up when you need us most. Call today for more information about our snow removal service. Make sure that your property is clean and safe after a snow storm. If you are need of any landscaping services, winter is the time to do it. We can offer big discounts on any landscaping projects you may need. We can create, design and install any size landscape and hardscape. 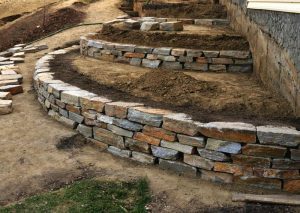 Everything from custom landscaping, retaining walls, hardscapes, sod installation, patios, driveways, irrigation, sprinkler systems, ponds, water features and anything you can think of outside, we can do it! Get your landscape installed in the winter and you will be able to enjoy it in the spring! How to Keep Grass Green When it’s 100 Degrees!